A certain grace and beauty, yet utterly lacking in mental acumen. 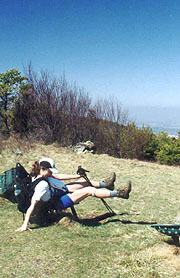 April allows another neatly-carved 4-day outing, and it seems a perfect time to finish nearby Shenandoah National Park. Known for plentiful deer, bear, and other wildlife, it is also renowned for its wide and well-graded treadway, and for the ample "town food" available every few miles. Oh well, two out of three ain't really that bad. "'Tis the best of humanity that comes out to walk"
By the time we reach Rockfish Gap, Coleen's ready to swear off the self-shuttling process forever, a result of me losing her three times in traffic - didn't really mean to, it's just that our decision not to leave til after church has left us pretty tight on time. Leaving the Del Sol here, we head north in the Eclipse to Swift Run Gap, filling out our backcountry permit and getting a few tips on water and a small forest fire west of our planned overnight from one of the girls there. 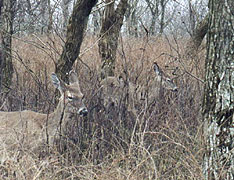 We pass a few deer as we head north on Skyline, and soon we're at Big Meadows, where I check in with Ranger Rick inside. Finding him clueless, we unload and head west in search of the A.T. at a late 5:05, although it proves elusive, the inset map not matching the terrain well. We wind through the employee housing area, finally connecting to the AT, where we march ahead at the typically easy Shenandoah pace. Passing Milan Gap we find ourselves making an unprecedented 3 mph, blazing across Hazel Top Mt, passing many deer on the way, along with several day hikers, and even one father whose son insisted on being brought here for his 9th birthday (beats Chuck E Cheese's). We leave the side trail to the Bearfence Rock Scramble for another day, with the descent leading to a small road that perfectly fits the map description of the road into Bearfence Hut, our planned destination. Our guess is soon confirmed by the sight of a roaring fire in front of the hut, with a fairly large crowd gathered about. 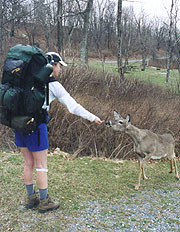 A couple deer scurry away to allow us entry, and we find 6 hikers here, a few of whom are tenting on the hill behind. There's plenty of room in the hut, so we throw our gear in the middle, with a couple set up to the right and two guys to the left (and the entire upper deck unused). We dive straight into our sandwiches as everyone chats around the fire, one lady in particular monopolizing the entire conversation. She's ostensibly hiking various historic trails here, taking a 3-week break from home-schooling her 3 prodigious kids, who allegedly can draw the map of the world with latitude / longitude accuracy. Another girl comes down from the tent area, a former Peace Corps volunteer in Samoa, with a few interesting stories from that time. As Coleen switches to her camp shoes, we find the hot spot on her heel is now a burst blister, very tender with some blood soaked through her sock. We're offered a Second Skin patch along with a large bandage, which takes care of it for the time being, and soon we have our cocoa, with everyone turning in about 9:30, and ourselves bringing up the rear an hour later. The snoring starts before we ever get to sleep, with the guys on either side of us trading off the duties - there's always one of them snoring loudly, and neither of us gets to sleep until around 2:30, despite earplugs. and that was nothing like a good night's sleep." 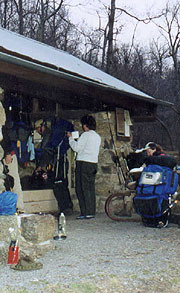 What's worse than finding yourself in a shelter full of snoring hikers? Finding out that they're hiking to the same shelter as yourself the next day. 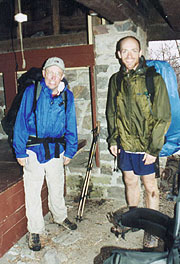 Yep, after a woefully sleepless night (Coleen says that when the snoring finally quieted, the mice came out), we find that the guys on the left (Bob & Flyboy) are hiking together, bound for Pinefield Hut as ourselves today. They're good guys, having met on the internet to hike together, but we decide from the outset that we'll probably tent tonight outside tonight. We're the first up, and though we're pretty quiet, everyone else is up and around soon thereafter. The deer are wandering around the site as we depart, still a bit skittish to stick around for food. We're underway by 7:30, Bob & Flyboy getting out a few minutes later, and we'll end up leapfrogging with them the next couple days. We immediately come on the side trails to the Lewis Mt campground, and I head through to survey the area as Coleen continues on the trail, lagging behind a bit with her aching heel. The Coke machine is turned off, as is the water here; although I do find a working pay phone to check our messages at home. By the time I rejoin Coleen she's been passed by both Bob & Flyboy, and after the short climb over Baldface Mt we take our am break, then push on to Swift Run Gap, stopping at the Ranger station for water. Bob's waiting with his and Flyboy's packs as Flyboy does the same, so we follow suit. By the time we return to our packs, they've taken off, hiking the road in view of the many climbs and descents on the profile view (the trail in Shenandoah roughly parallels Skyline Drive through the park, and many hikers choose the latter as an easier "short cut" to the trail). We're only a few minutes behind them, but our route is far more difficult, starting out with about a 1200' climb over Hightop Mt - an imposing-looking climb, even if we've done climbs far greater previously (and it's warming enough now to make any climb a chore). We catch a quick lunch about 2/3 of the way up before continuing the well-graded path, taking us dead over the summit as seems to be the Shenandoah norm. After Powell Gap we take our pm break, with Coleen's heels hurting badly enough that she wonders if she can even continue. I consider ditching her pack somewhere for a pickup on the return, but make one last effort to convince her to try hiking without her new insoles. She's finally willing to give it a try, taking these and the arch supports out, and we forge on through the climb and back down to Simmons Gap. There's a ranger station 400 yards off the trail where we could fill our water, but we decide it's too far, and continue our final climb over Weaver Mt, with Coleen staying up with me for the first time in the hike. On asking, she reluctantly admits that her feet are fine for the 1st time in the hike - I'm relieved just to know she can keep hiking. Soon we're at Pinefield Hut - a nice hut, similar to Bearfence, and lying just across a clear-running stream. Bob & Flyboy have been here just long enough for dinner, and with plenty of daylight left, we chat for a while with Flyboy as we start our own. He's ex-Air Force, having hooked up with Bob via the AT list, and familiar with our Patriot Express flights (though he's never taken any himself). Though there's not much firewood around, I decide to burn the mound of trash left in the fire pit; and as I do, I throw a few sticks and twigs in. Soon I've got a respectable fire, with the guys quickly joining the charge to find wood. Soon we've a huge stack, and Bob's goal seems to be to consume it as soon as possible, in spite of our chiding him about global warming and such. As the guys start to bed down, we announce our intent to sleep out under the stars (something we haven't done before), dragging our bags and tents up the hill to the tent sites. We lay our tent down to sleep upon the most level site, and using the rain fly as a covering for Coleen, but it's still a bit sloped, and too short to adjust our angle much. We select a compromise position and turn in at 9:55, although sleep eludes me for some time. All who wander are not lost." The "sleeping under the stars" allusion proves a misnomer, as we spend much of the night bereft of either sleep or stars. Luckily, the gathering clouds don't yield any rain, and we're actually both asleep in the wee small hours when some animal rouses us pawing around our site (never see him, but it's probably a deer). We're up for good at 6:47, taking the tent down to the shelter with everything wrapped in it, so we can pack as the coffee boils. The boys get up just behind us, and by 7:55 we're out, the guys close on our tail. We start with a couple ups and downs as we approach Loft Mt., deciding here to take a side trip at the Ivy Creek trail in hopes of finding a phone at the Loft Mt. Wayside. As expected, the Wayside's not open yet, but we find some workers getting it so, and though there's no pay phone here, there is a water tap. There's a Pepsi machine as well, but we're cool enough that it's not very enticing, and we cross the road to meander through the Loft Mt. campground on our return to the AT, still seeking a phone. At first we were afraid we'd be cheating ourselves out of a little elevation gain on this route, but it quickly becomes obvious we'll go to the same summit as the AT, climbing steadily on a paved walkway crowded with deer. It feels odd walking through the deserted campground, and soon we're at the Camp Store, finding no phone here, so we continue on towards another store marked on our map. We do find a locked restroom in the picnic area, and decide to stop here for our break, with one deer sitting calmly a few yards away. In spite of the numerous warning signs, we decide to try to get him to eat some Triscuits - takes some doing on the 1st one, but after a sample, he's quickly back over for more. We meander about the campground trying to return to the AT, finding our map horribly outdated, with little resemblance of the surrounding area. Finally we accidentally stumble on a closed Ranger station with a phone, after which we resume our search for the AT. We finally locate it, finding Bob sitting on a rock eating Gorp, with Flyboy having pushed on ahead towards the Blackrock Hut, their planned overnight. They'd searched the area in vain for a Coke machine - had I known we'd see them again, I'd have brought them one from the Wayside. Descending to Brown's Gap, a light rain begins, soon continuing unabated, but it's not terribly hard, and we push on without pack covers. We run into Flyboy just as we approach the summit of Blackrock Mt. - he's coming back northbound, having elected to bypass the summit on a blue-blazed trail, but we stick with the white blazes for the full treatment. 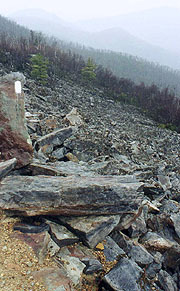 It's a good call for each of us, as the summit is an incredible rockpile worthy of several pictures - the well-groomed trail around it must have taken incredible work to construct, and we reflect that were we anywhere but SNP, this would be a little slice of hell. As we start down the descent, we see the hut in the hollow below, winding down its long side trail. By now the rain's falling heavily, and it's good to pull in under roof for a bit, finding Flyboy here cooking lunch, and with Bob pulling in soon after. We take our late lunch here, finding from Bob that his knee has given out, and he'll be pulling off the trail after leaving here. He's doing OK except for downhills, and plans on taking the road out until he finds a ride, eschewing our offers of help. Flyboy amuses us with a small explosion of his commercial alcohol stove, spewing flaming alcohol about, but by some miracle his now-holey rain pants seem the only casualty. We're discussing how to get Bob out as a northbounder comes in, telling of ample campsites but no water ahead, so we fill one water bottle with spring water before shoving off. Bob & Flyboy head out first, making a surprisingly good pace, and we're just behind, saying goodbye at Blackrock Gap, where Bob takes to the road as Flyboy beats feet down the trail in hopes of making Calf Mt tonight. We soon come on Arkansas Traveler - a Baptist minister from Knoxville who's come this far from Springer over a 9-year period, and who openly asks about our Christianity. After passing the Riprap trail the rain lets up, with a clear space and even a little sunlight appearing to the west. Atop Wildcat Ridge we find plenty of good campsites, but it's early an we're still picky, hoping for one on the sheltered east face of the mountain. At the end of the ridge the trail starts its descent around to the east side, with a suitable clearing here that looks previously encamped, with several flat rocks on which to sit. We set up camp, setting some clothes to dry, but soon the rain starts again, and shortly after dinner it intensifies, forcing an early retreat to the crowded tent. We have our hot drinks in this position, and finding ourselves somewhat trapped here, we both lie down and nod off in spite of the rain pounding on the tent fabric. Finally at 11:00 we get up during a lull, getting out to hang the bear bag before turning in for good. but sometimes it is a great relief." We're up with first light, the wind now howling from the NW, and our tentsite better shielded this morning (though it still lifts the tent edges occasionally). Being homecoming day, we're easily motivated for the prep, though the howling wind and cool temps persuade Coleen to put on everything imaginable before climbing out. The final clouds retreat to the east, and it looks like a grand day out, though everything is still wet from last night. The last day's prep needn't be neat though, and we're on the trail at 7:28, starting with the steep descent into Turk Gap, and thence on towards Calf Mt shelter. The deer are out en masse again today, and the wind calms quickly as we descend, passing the beautiful Moorman's River where our ascent begins up Calf Mt. Its pastoral mood is marred by a spat we have here, Coleen wanting to stop to remove her jacket, but me wanting to wait until the shelter, where we'll be stop to see if Flyboy's still around. My suggestion that I continue to the shelter as she stops doesn't help the matter any. She does so, taking an extended wardrobe rearrangement here, and as I continue, I run into Boone & CB, a nice couple out to try the AT for a couple months, having begun yesterday from Rockfish Gap. They're full of questions, and I'm all too happy to oblige, leaving Coleen a bit confused as she pulls up much later to find us still chatting. We bid them a good hike and a few minutes later head down the shelter trail - a long and rocky .3 off the trail. Flyboy's left some nice comments in the register about us and his experience, but, we've miles to go, so it's back to the trail, now both bereft of our jackets as we finish the climb over Calf Mt. The trail turns considerably more rocky now that we're out of Shenandoah, though there are a number of beautiful alpine meadows and pine glades to traverse. From Beagle Gap the trail marches straight up Bear Den Mt without switchbacks, but the scenery makes up for the tough trail. There's a collection of communications towers atop the Mt, along with an odd assortment of tractor seats overlooking Waynesboro. From here we descend into McCormick Gap, with a short, but very steep climb out. It's all we'd expected and more, and though I'm spent by the top, Coleen's lagging far worse. I yell to her that I'm at the top, getting no response, and as I continue on the level segment, she lags further and further. I stop several times and look back to check her progress, but the last time I look she's just standing there on the trail, unmoving. I decide to forge ahead, with a bit more rocky trail before it finally connects with a forest service road for a while. It's here that I hear a commotion to the right, looking downslope to see a pair of bear scrambling off into the valley - about 40 yards away when I first saw them, but well out of range before I could get the camera out. Coleen never catches up, and I suddenly coming upon the noise of I-64 and Rockfish Gap. As I'm trying to load up the car, I'm beset by the very talkative shuttler Del from Daleville who's waiting for a hiker. He's a tough guy to lose, and it's a relief to finally see Coleen come limping across the bridge, her feet aching again. Our "back to civilization" meal is at the hiker favorite Weasies (known for its AYCE pancake special), finally able to enjoy the burgers and ice cream that hikers normally feast on throughout the park. It's sad to leave Shenandoah behind, but now it's time to look north, to the unique beauties and challenges of Vermont.